Woke up at 16:00. I needed water and electrical adaptors — the two main items in the UAE food pyramid. The 400+ stores of the Marina Mall extend along the breakwater just off the island of Abu Dhabi. In it, along with a movie theater, grocery stores, and a bunch of English chains (I’ll get back to that), is an IKEA. Just like any other IKEA. If you didn’t look up at the labels in Arabic, it would have felt like anywhere else in the world — no Scandinavian Persian rugs, no Swedish sandal racks, no ergonomic falafel-ballers. Though I’ve heard IKEA names come from various names of way up north places or other families of words (occupations, kinds of flowers, sizes of umlaut) depending on item category, I started to doubt it. I wondered if oddly familiar-to-English names like the baby crib “Sniglar” would sell as well with Arabophones. Sounds like “snuggle” in English. Means “slug” in Swedish. The exit to the mall smelled of Krispy Kreme and incense. You want a donut, but you feel strangely calm with the decision. 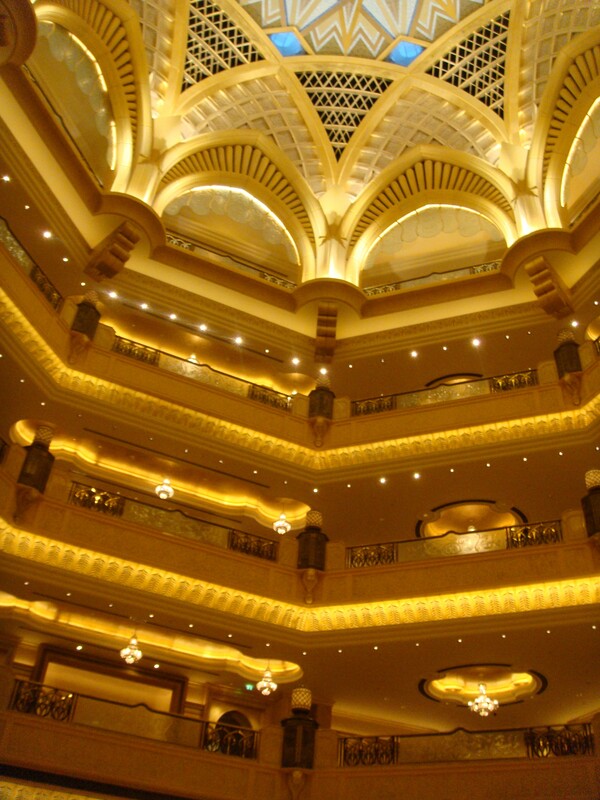 For tea and wandering, I stopped by the Emirates Palace where the rule is: if it looks like it, it is. The 800 palm trees inside are real (though sometimes petrified). The vaulted golden domes and ceilings are real gold. The tea is not Lipton. Somehow, inside the luxury is not oppressive — the shimmer of Swarovski Crystal and gold-plate feels distinctly elegant. What appeared to be a “Whites Only” section of the parking lot (the cars, that is) — with its unflinching Beamers, Bentleys, Rollses, and a Maybach — seemed a little like the world’s best cake shop with a cupcake stand out front. Make of that what you will. And pulling a complete about-face, I ordered Indian take out to my apartment doorstep (complete with tip) for 5 dollars. Saturday (read: Sunday), I went to find any electronics shop open on a Ramadan afternoon to buy a TV cable. It must have only been 104 or 105 in the late afternoon, but I still felt like I was getting used to the heat just a little bit. And I started to worry about my future in cold places. What happened to him? He used to be cool. Now he just shivers a lot. Luckily, I live in the electronics district. See, in the Third World — and let me stop myself for a moment. This is only meant as a means of distinction, where the dividing line is this kind of business decision. In no way should this be a cause for disrespect — no one said that in the “First” world, it works any better — it’s just different. The million dollar question is: if you are a flower shop, do you open up a) in an area that needs flowers, or b) next to your friend’s flower shop? If you said “b,” you are the Third World. In the Third World, businesses that sell the same thing flock together (it probably rhymes in the Arabic). If you need shoes resoled but you don’t live in Cobblertown, well, you’re gonna need to go to Cellphone Street and call the boy from Messenger House to go bring them in for you. And if you need gadgets on Avenue al-Electronics like I do, you’re gonna have to get loyal quick. At night, led my someone more knowledgeable, I ventured into another mall. At 10 or 11, things start to get busy — families, couples, friends, tourists, everyone just out to eat kebab and buy stuff and hang out with each other. For a place with “irate” right in the name, the Emirates are really pretty chill. Who is driving the cupcakes?